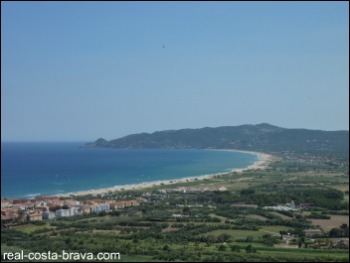 The beach of L’Estartit forms a 5 km golden sand crescent with Pals beach, that it meets roughly half way, at the mouth of the River Ter. Beyond Pals beach lies the first of Begur’s beaches, Platja del Raco, at the foot of the Begur headland. The beach of L’Estartit was awarded a Blue Flag in 2007, 2008 and 2009. It wasn’t awarded one in 2010, but we are unaware of the reasons for this. L’Estartit is also one of the best spots for scuba diving on the Costa Brava (in fact, in all the Mediterranean). The end of the beach that starts in the town of L’Estartit (Platja Gran) offers all the usual beach amenities such as pedalos, kayaks, sunbeds and beach bars. The shops and restaurants are also nearby. There is also a car park right behind the beach, which makes it really convenient if you have kids and all the paraphernalia that goes with them. There are also life guards and first aid facilities at this end of L’Estartit beach. It can get quite busy here at the height of summer, but just walk a relatively short distance along the beach towards the River Ter and you will often have it all to yourself. 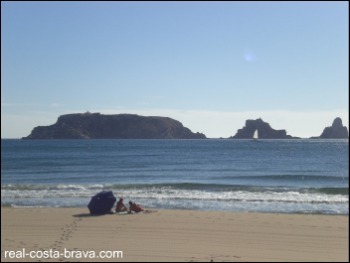 Platja de Griells is the next part of L’Estartit beach. It lies in front of the Els Griells housing estate (which conjures up a hideous Benidorm like image...but it is actually very small and inoffensive). If you are looking for watersports (other than scuba diving and sailing, which are available from L’Estartit town), this is your beach. From here you can kitesurf, windsurf and kayak (the River Ter also makes for great kayaking). 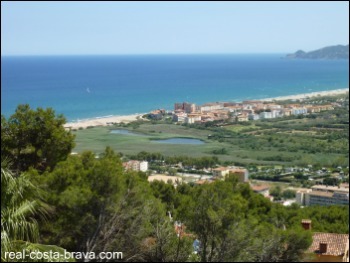 If you want real peace and quiet, go a bit further along L’Estartit beach, towards the river, and you come to Platja de la Pletera. 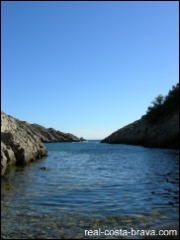 This part of the beach, near the River Ter, is backed by the low sand dunes of the Ter Vell Natural Reserve and the plain of the Baix Emporda. It has a really wild feel to it. There are conservation methods in place to protect the sand dunes (and the other native flora and fauna) that run along the whole of the Platja de Pals-Estartit beach (the ), but you can still walk on the paths that criss cross the plain. A good place to spot coastal birds. The Platja de la Pletera end of L’Estartit beach is is our favourite early morning running spot with the dog. Here you can lie back and look at the marine reserve of the Medes Islands ahead of you, Pals and the Begur headland to your right and the Montgri Massif to your left. Although, not strictly a nudest beach, the wilder end of L’Estartit beach does attract the odd few discreet nudists (usually early in the morning). You can drive to this end of L’Estartit beach on the road that runs behind Els Griells. 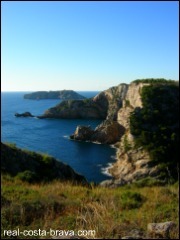 There are three coves, cut into the beautiful Montgri Massif, that are within walking distance of L’Estartit. In fact, you can only reach them on foot or by boat, which keeps them pretty secluded. These coves are great snorkelling spots. You can drive up on to the top of the Montgri Massif and walk from there…from Carrer de Barcelona take Pujada de la Primavera, then take a right on the road sign posted L'Escala (see our walking page on how to find the coves from there). Want to see what the L'Estartit beach and harbour look like right now?…take a look at the beach webcam. Zoom in on Torroella de Montgri and then L'Estartit on the map below to see the numbers and names of the roads. The nearest motorway is the AP7. From Barcelona. Please see for details. From Girona and Flaca. Please see for details. The nearest train station is Flaca (22km away). 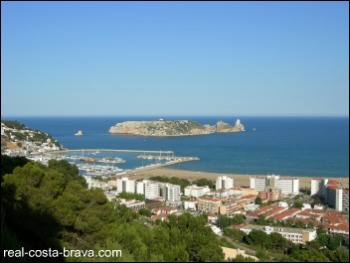 The nearest Costa Brava airport to L'Estartit is (57 km away). Check out flights at . 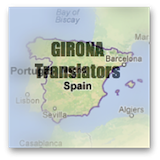 The next closest Costa Brava airport is (150km away). Check out for flights.